L 23″ (58 cm) W 55″ (140 cm). Description: Sexes similar. 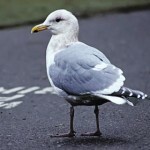 Breeding adult is pale gray above (slightly darker gray than Herring Gull) and white below; usually show a dark eye; yellow bill with dark red spot; legs are dark pink. 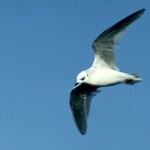 Winter adult is similar to breeding but has brown streaking on head and breast. Second winter bird has a gray back, brown wings, and black tip at end of bill. First winter bird is variable, from brown overall to white with brown mottling; always with a dark eye and totally dark bill. 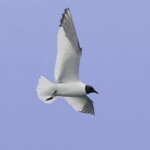 Habitat: Breeds in the arctic, and is usually found along the Pacific Coast during the winter. Where in Nebraska: Very rare. As of 1996 there were only 22 reports of this species in the state. Observed at Lake North, Platte County in 1981, at Gavin’s Point Dam in 1985 and 1995, and at Cunningham Lake in 1995. 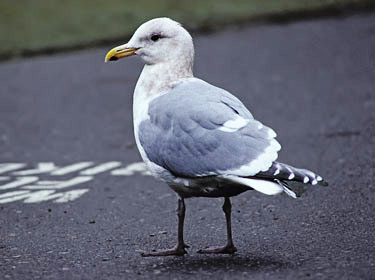 Fun Facts: Due to it’s similarity to Herring and Iceland Gulls, even experts have a difficult time identifying Thayer’s Gulls in the field.